Precious Essence Flower Essences - What do they do? Healthy, vital sense of Self; healing and beneficent forces arising from within oneself, deep sense of wellness and wholeness. Inability to take inner responsibility for one's healing, lacking in spiritual motivation for wellness, overly dependent on external help. Self-Heal flower essence is one of the most fundamental and broadly applicable remedies for true soul healing and balance. Its very name is exquisitely evocative of its profound qualities; this essence addresses the capacity of the Self to become involved with and take responsibility for its own healing journey. No variety of outer measures and techniques can bring about genuine healing at any level unless the individual is quickened within and motivated to seek and affirm the wholeness of life. Self-Heal flower essence addresses a very special relationship between the etheric, or life body, and the Spiritual Self. On the physical level, the etheric body restores wholeness to wounds and others afflictions by quite literally “re-covering” the body with its life sheath. The Higher Self can also draw upon this etheric life force and the possibility for recovery. 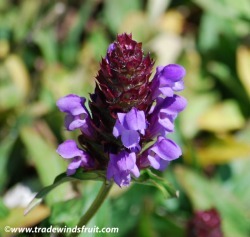 Self-Heal flower essence is especially indicated for those who have lost belief in their own capacity to be well. I am shown a picture of this flower moving in a spiral pattern, puncturing what looks like felt. It reminds me of the motion a cotton candy vendors use at the fair make cotton candy. 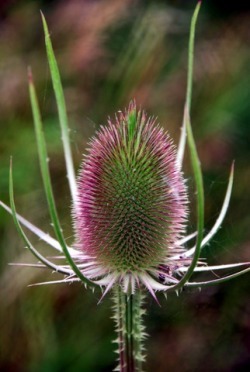 I read that teasel was used to make cotton fabric since ancient times. 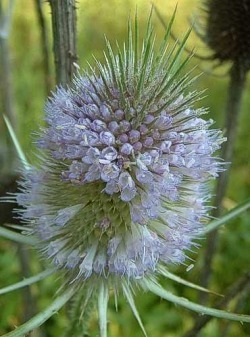 I read that no machine-woven fabric could be as soft as fabric made using teasel. This seems important - the sharpest thorniest thing helps to make the softest thing. It made a strong cohisive fabric from which to make clothes (protection) from (foundation). this plant is a warrior - unchangeable, immovable, unimaginable strength with periodic breaks in the facade - they create strength - the breakes are where the light is. has come to be known as a power crystal with prolific healing powers which can be characterized as purifying, pacifying and transitional. Amethyst has the ability to transform lower energies into higher and acts as a healer at all levels of mind, body and spirit. The healing powers of Amethyst date back as far as the ancient Greeks who believed that Amethyst protected from the intoxicating effects of alcohol. The word "amethyst" is of Geek origin and is translated as- "amethystus" meaning not drunken, or intoxicated. Amethyst as a healing stone contains sobering and calming qualities which allow this stone to be commonly associated with peace. Amethyst is known to calm and protect the mind. It soothes those who have engaged in constant rigorous mental activity. It has been deemed "nature's tranquilizer" by many healers because of it's effectiveness in relaxing not only the mind but also the nervous system. Those who wear amethyst jewelry and who have been recommended to wear this stone for healing purposes have done so because of its tranquil qualities and it's ability reduce negativity and alleviate anxiety. Besides being a stone of tranquility and repose, amethyst is also known to enhance mental strength, stability, and vigor. It also is protective in averting the mind from psychic attacks and transforming negative energy in to that of positive and tranquil tenacity. It is also used to bring understanding of all that is transitional, especially death and rebirth. It can provide security and peace of mind (along with understanding) when a loved one is lost or reborn. It is said to also have a relieving effect on stress, grief, depression, emotional despair and ineffective communication. Amethyst has identified as a crystal that functions favorably in clearing certain types of blockage and in aligning the Chakras. By transforming energies on all levels amethyst also has the ability to balance and stabilize energies located within certain Chakra areas. Amethyst is related to and found to heal and align ailments of the the 6th and 7th Chakras, which are the Third Eye or Brow (6th) and the Crown (7th). Amethyst aides the 6th Chakra, Third Eye, by opening and heighten awareness, both spiritual and psychic. Its calming qualities help to awaken and ease stress in this area. It helps to also heighten perspective and allows development of strong introspection (inner-self view). Amethyst is used to also increase intuition and psychic development. The Third Eye is the energy center for all levels of consciousness for which amethyst aides the in the transition from a normal state of consciousness to a deeper awareness. The 7th Chakra, or the Crown controls the energies used in any mental activity. Amethyst helps to relieve strain or tension in this area. It is considered a helpful aide in meditation and in the facilitation of psychic visual enhancement. It is used on the Crown to allow past life recall to emerge. It's tranquil sobering effect allows those who are energetic to relax. It also is a cure for insomnia and nightmares and makes the intuition sensitive to understanding that outside of scientific reasoning. is self-esteem stone with powers to heal the mind’s feelings of inadequacy and deem it essential for handling negative criticism. It is also good, according to believers, as an energizing stone against power issues of willpower, optimism, confidence and self-discipline. Secondary mental healing traits include its ability to awaken the mind, create clarity and increase knowledge of the self, as well as general relaxation and emotional healing powers and protections against overwhelming fear, depression, money worries and security. Further, because of Citrine’s ability to increase knowledge of the self, New Age healers recommend it in times of introspection, when making choices or when creative solutions are necessary. Used to cleans the body of toxins and regeneration of body tissues, Citrine is essential for maintaining the health of the digestive, circulatory and urinary system. They believe it eliminates toxins in the second and third chakras and has the power to assist in ailments where toxins can cause discomfort or disease, such as acid indigestion, poor blood circulation, food disorders and allergies.